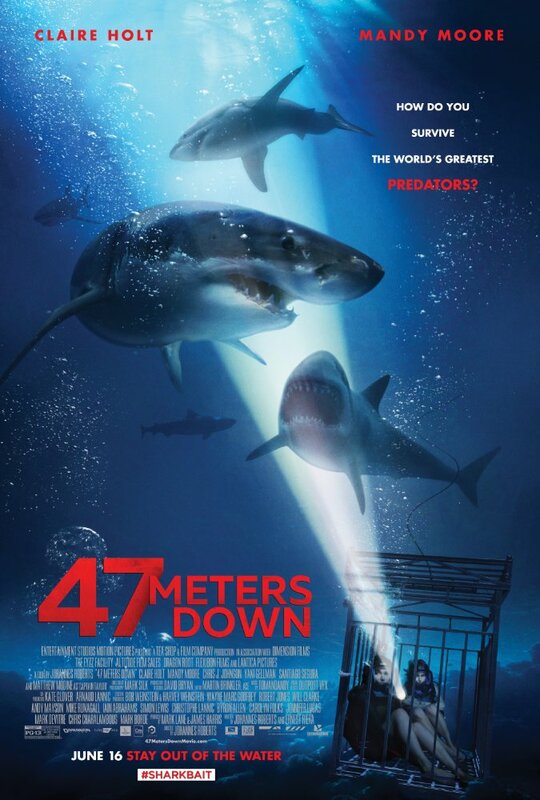 I fear that too many of us take simple-minded and daring movies like 47 Meters Down for granted, especially because when they’re done well – as this film is, for the most part – we lose sight of the rigors it powers through to become a picture played across screens nationwide. It’s far simpler to stage an award’s baiting character drama than it is to produce a believable story which almost entirely takes place under water; a bit of timeless movie magic is the primary ingredient when it comes to making us fall for this sort of hoax. So while 47 Meters Down sorely lacks substantial character development and is far less thrilling than you’d expect given the premise, it’s still a well-crafted, passionately performed, and slightly upscale take on Syfy channel nonsense shot with an acute eye. The adventurous Kate (Claire Holt) vacations to Mexico with her recently dumped and more anxious sister Lisa (Mandy Moore). We’re never fully introduced to these women in their resort. There, 47 Meters Down concocts itself like a cup of over-steeped and bland black tea. It’s concentrated to a fault, bitter on the tongue, the last sip a bit grainy and cold. What eventually occurs inland counteracts real personal meaning while the mystery of deep water isolation literally points to and descends into a place of more intimate understanding. The intermittent scares only faintly feel real, the pointless drama is far too often hands-off, and yet we still end up with a breakneck and time-crunching Tower of Terror plotline that abruptly drops us below the surface. Nothing is new here and yet it looks unrecognizable, like driving southbound on your normal trip north. Things appear different from this tainted perspective. These two ladies party and meet locals and agree to dive with sharks. It happens within the span of minutes in an exaggerated and tonally defining moment that helps to unlock the rest of the picture. But I also believed it from my own experience because enough afternoon happy hour drinks and Redbulls and late night shots at the dance clubs can, and sometimes do, ultimately lead to mysterious mornings. Having vacationed in Cabo multiple times, I can vouch for the picture’s sucker punch premise of Gringos meeting locals; I remember once briefly kissing an old acquaintance on a bar’s sky parlor catwalk before walking her to the same hotel, us both living in and allowing the hazy moment to exist as it was. Those types of moments aren’t recurring but tend to linger. 47 Meters Down captures them – at least from my American vantage point – with a broken and sailed tee shot over the reefs. This is island life comically gone awry at every turn. I normally can’t stomach people who recommend a film and leave saying, “it just is what it is.” Yeah, and so is sickness, but sometimes treatment and vaccines actually cure. There are easier ways to mend the ends to broken means than resorting to basic biotics. As such, 47 Meters Down doesn’t look like anything spectacular or memorable, nor does it leave us with anything more than a fleeting footprint soon to be washed away from the shoreline. Director Johannes Roberts treads this thin line like a hustler hedging his bets, reacting and reciting the alphabet of B-movie standards backwards and focusing his camera in the near the sea floor. Roberts’ movie was a deceptively difficult picture to produce, a hard one to perform tethered in gear with muffled masks, and an elevated take on material normally reserved for the likes of Tara Reid and Tori Spelling. 47 Meters Down might scribble and erase its human depth to an unforgivable degree, yet it also dares to retrieve the brick sunken in the deep end without any of the lifeguard training. It’s as knowingly stupid as it is laudably brave.